Ernest “Van” Sievers is a Certified Public Accountant and CERTIFIED FINANCIAL PLANNER™ practitioner. He holds a master’s degree from Faulkner University’s Harris School of Business, and a BS from Auburn University at Montgomery. 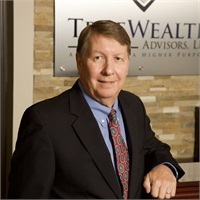 He has over 18 years experience as a registered representative and managing partner in a local financial planning company based in Montgomery, Alabama. Van’s primary financial experience involves financial planning, retirement planning, and investment management. As a member of the Auburn University at Montgomery Alumni Association, he has served as a Board member and President. Also, Van has served on the AUM School of Business Advisory Board for several terms. Van has published numerous articles on financial and estate planning. He is married to Sarah Russell Sievers and has one son Russ.